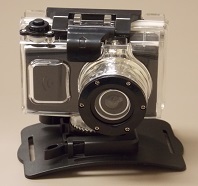 Valor System’s new Waterproof Sports Camera, the Avenger, is the latest in Sports Camera Technology. The Avenger is equipped to handle up to 50 meters of under water pressure with Full HD 1080P video quality. Now you can video all of your sports activities in full HD quality, and replay them for your friends. Are you into Mountain biking? Surfing? Off-road racing, or maybe Skydiving. Now you can capture all of your fun on one small, compact camera. It comes with multiple attaching hardware so that you can be ready to switch from one sport to another with a simple click of the switch. Now the Avenger has a new hero! to start videoing any or all of your sports Hobbies.